Earthquakes occur on fractures, or faults, within the Earth. Active faults have ruptured repeatedly, and may move again. 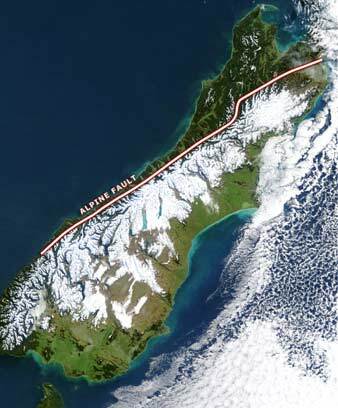 The most spectacular is the Alpine Fault, where the Southern Alps are being uplifted. The city of Wellington was built, unknowingly, on another active fault. Geologists have now identified many of these lines of weakness, and there is greater awareness of the hazards of building where the earth may suddenly shift again. What is an active fault? Faults are cracks in the earth’s crust and can be up to hundreds of kilometres long. When stress builds up in the crust, it can eventually cause the rock to break suddenly along a fault. This movement releases energy, and is felt on the ground surface as an earthquake. Earthquakes, sometimes very violent, may occur many times on the same faults over millions of years. Many of the faults in New Zealand are ancient, and have not moved for thousands of years. Others have moved often, and many have broken the land surface. These are called active faults, as they are the most likely to move in the future. Several earthquakes on active faults have happened since European settlement. Where are New Zealand’s active faults? the Alpine Fault in the South Island. Kekerengu, Papatea, Jordan Thrust, Hundalee and other faults (2016 Kaikōura earthquake). What are the signs of an active fault? Active faults may form visible ruptures across the landscape, such as the Greendale Fault across the Canterbury Plains, where the land moved up to five metres sideways during the 2010 earthquake. Vertical movement can result in steep scarps, and mountains can be formed from repeated earthquakes and ground movements over thousands of years. Many earthquakes on the Alpine Fault have lifted up the Southern Alps. Why is an active fault a hazard? When a fault ruptures during an earthquake, structures built across it are torn apart, and people can be injured or killed. In the past, the people building New Zealand’s towns and cities did not know about faults. For example, many buildings lie on or near the Wellington Fault, and other centres such as Nelson and Waikanae are built on active faults. Today there are rules preventing new construction near a known fault. The best way to avoid destruction and injury is to make sure that houses and other structures are not built across known active faults.